All of these images are from around 00 UTC 1 May 2012. 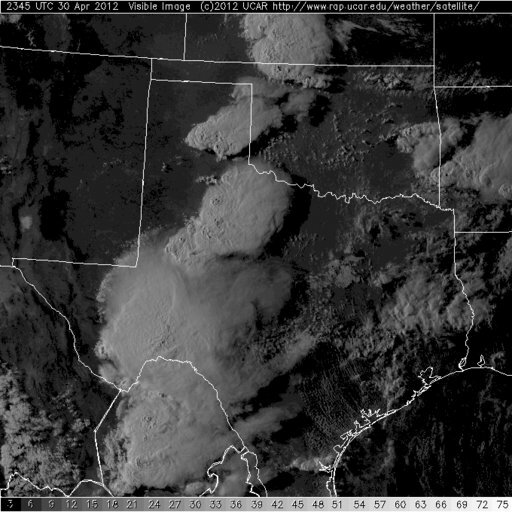 Above is visible satellite image showing large thunderstorms from southwest Kansas, southward through the Texas Big Bend country into Mexico. Regional radar charts (above and below, from NCAR at the base-scan level) capture numerous supercells, as well as numerous boundaries of various types. Note the starburst of boundaries spiraling around Lubbock. Lubbock was pounded by large hail yesterday and today these storms are producing large hail from golfball to tennis and softball size. 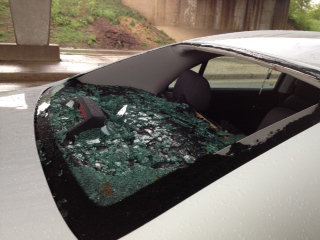 Many more broken windshields for the third straight day. Edited to add radar image. 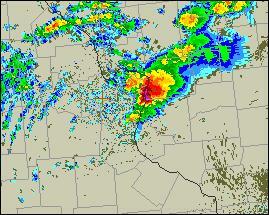 The radar image above is from the St. Louis area NWS radar at 2012 UTC yesterday afternoon. The radar loop shows that a large, supercell thunderstorm developed to the northwest of St. Louis and then moved toward the southeast, directly across the metro area. Severe thunderstorms moved through the St. Louis metro area and the East side during late afternoon yesterday (Saturday April 28th). Storms produced both large hail (above is from near Collinsville, on the East side, and below is from St. Louis suburbs) and strong winds. They weren't storm ready at Kilroy's Tavern near Bush Stadium downtown. A temporary tent blew down while filled with a noisy, post-game crowd who didn't even hear the storm coming, according to morning media reports today. One person was killed and 120 were injured. Last August the collapse of a temporary stage, during a severe thunderstorm, at the Indiana State Fair made national news. Here in the Tucson area we had gusty winds and some dust yesterday, along with a few spits of rain. Only 1 station in the Catalina Mountains reported measurable rain - 0.04" and an areal coverage across the ALERT network of about 1%. 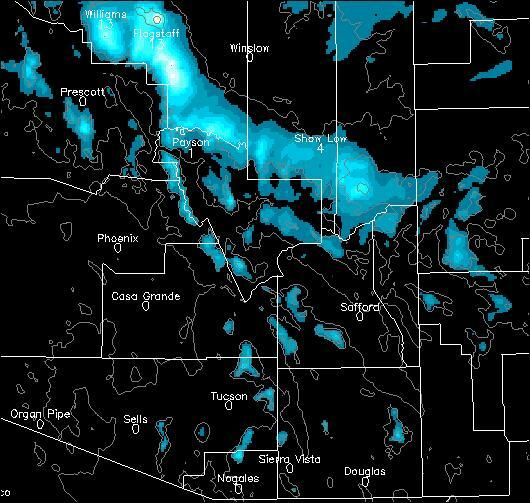 The Phoenix, composite radar chart for about 18 UTC yesterday (above) indicates that considerably more shower and thunderstorm activity occurred over south-central Arizona. 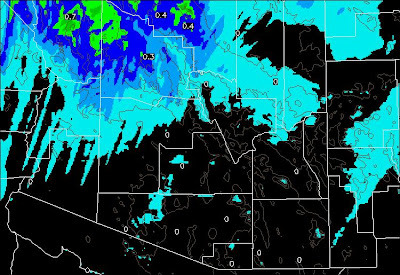 However, amounts in the greater Phoenix area were generally light. 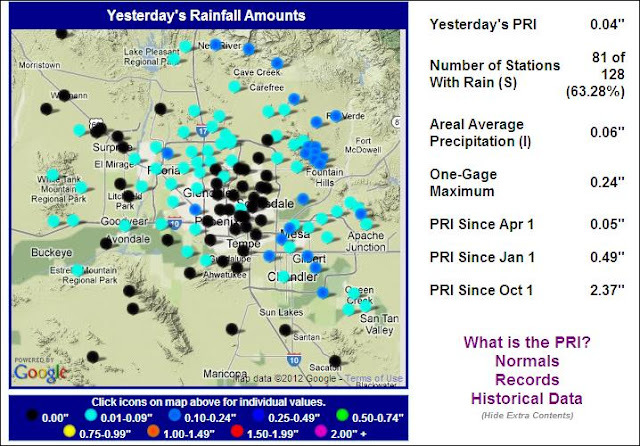 The Phoenix Rain Index (PRI) for yesterday is shown below. At PHX there was 0.02" and at the Scottsdale Airport there was thunder and 0.04". So, serious drought continues here in southern Arizona. Is Southern Arizona Desperate For Weather Or What? Storm system starts to produce rain in the valley, our chopper is launching to cover! Image above is satellite water vapor at 1430 UTC this morning. The upper-level short wave is just north of the Salton Sea. It is forecast rapidly eastward across northern Arizona during the day today. The system will bring a pronounced cold front and gusty winds across southeastern Arizona. The water vapor loop indicates dry, upper-level, Pacific air being pulled around the bottom of the short wave, meaning that any convection that develops around midday will likely be relatively shallow. The early run of the WRF-GFS at Atmo again indicates little precipitation with this event, as was the case with yesterday's model forecasts. 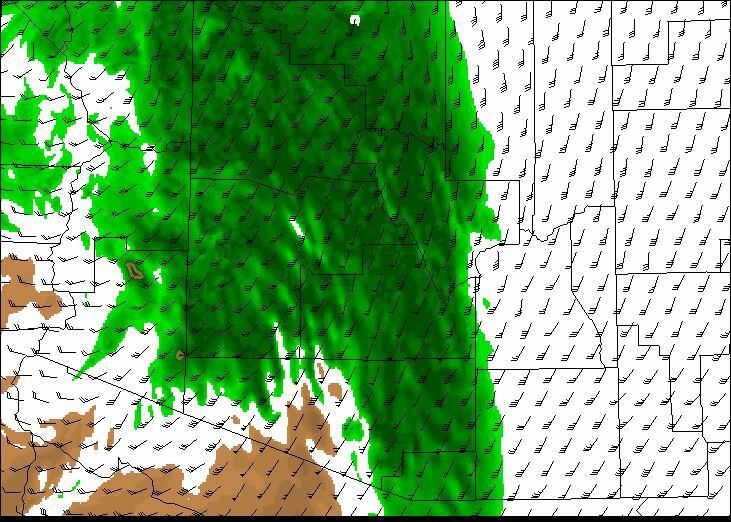 The 700 mb forecast of RH (above) indicates a band of frontal moisture crossing eastern Pima County by around 10 am. There may be virga and light showers with this band (note that there was a very slight spit of rain around 5 am here at the house). The WRF-GFS forecasts very light rainfall amounts (below) through midnight, confined to higher elevations. So, a promising event that has weakened as it got closer in time. So it goes. At 1300 UTC this morning the blended PW product for the eastern Pacific (above) shows the closed low at around 30N and 130W, i.e., considerably west-southwest of San Diego. There is a broad plume of higher PW being pulled northward along about 120W. Thus, one would think that prospects are good for this system to impact southeastern Arizona with precipitation. However, all of the forecast models have a more negative solution. The models forecast the best moisture to push northward across northwestern Arizona into the Great Basin. Above is Atmo's WRF-GFS forecast (from midnight last night) of accumulated precipitation from now through midnight on Thursday night. Basically, the model forecast leaves southeastern Arizona out of the precipitation action from this system (point forecast matrix indicates 0.01" for Mt. Lemmon). Below is the NAM precipitation forecast (from 5 am MST observations this morning) ending at the same time as the WRF-GFS, with a similar dry forecast for here. The GFS ensembles from 5 pm MST yesterday had no members forecasting rainfall over southeastern Arizona. 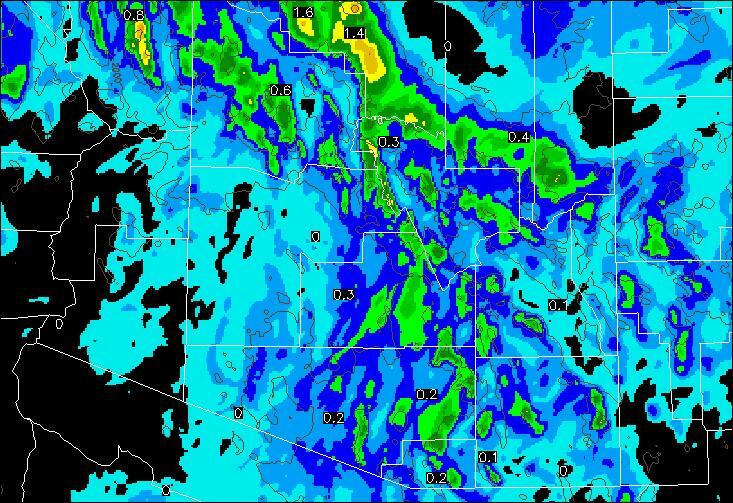 The graphic below shows the WRF-GFS forecast surface chart for the local Tucson area - valid at 3 pm tomorrow (Thursday afternoon). The forecast indicates warm and dry, with dewpoints remaining in the 40s, but with strong southwest winds. The timing of the front may be slow in the WRF-GFS, which doesn't bring it through the metro area until 5 to 6 pm tomorrow. The WRF-GFS does bring a frontal band of high RH, at 700 mb and above, across southeast Arizona. Thus, it appears that April's second weather event will likely bring winds, dust, virga, some possible sprinkles, and perhaps some nice mammatus clouds. High-based thunderstorms occurred yesterday over some of the higher elevations of southeast Arizona, New Mexico, and northern Mexico. Lightning strikes have started at least one forest fire near Safford. Above is visible satellite image from 5:30 pm MST yesterday afternoon. 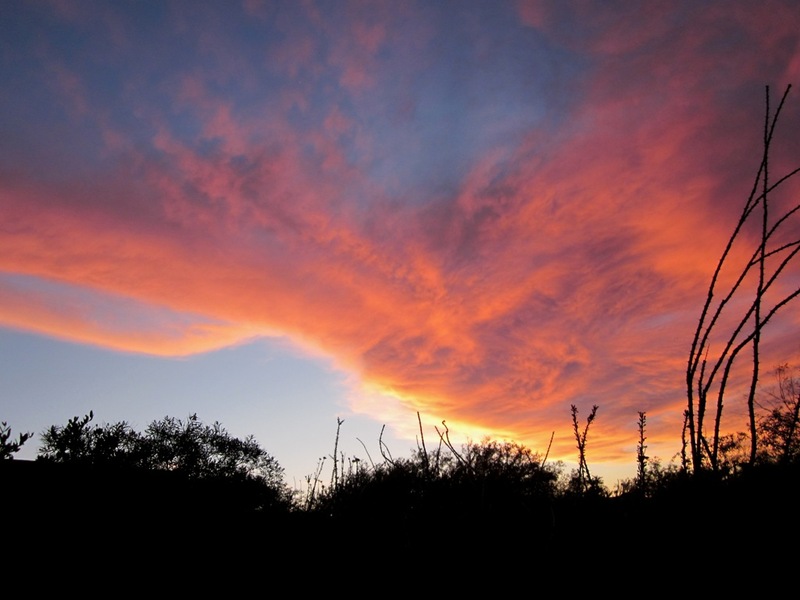 The cloud debris made for a colorful sunset here in Tucson. The shot below is looking toward the west from our backyard. 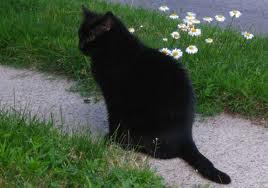 It was an interesting day, almost enough to make one think that the summer thunderstorm season will be starting soon. 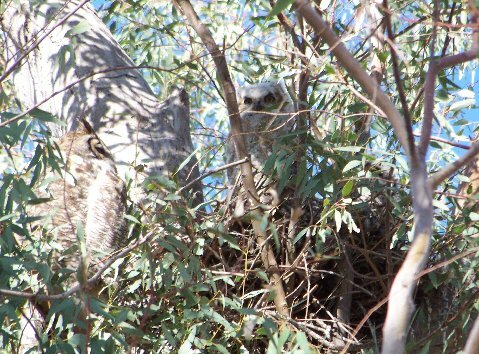 A neighbor got good photos of the Great Horned owl and one of two nestlings down by the Rillito. Looks like the little ones are about ready to leave the nest. 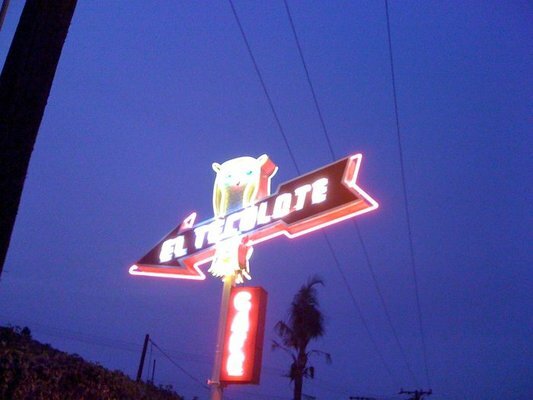 "Tecolote" is Spanish for owl, as in above photo showing sign for a California cafe - The Owl Cafe! 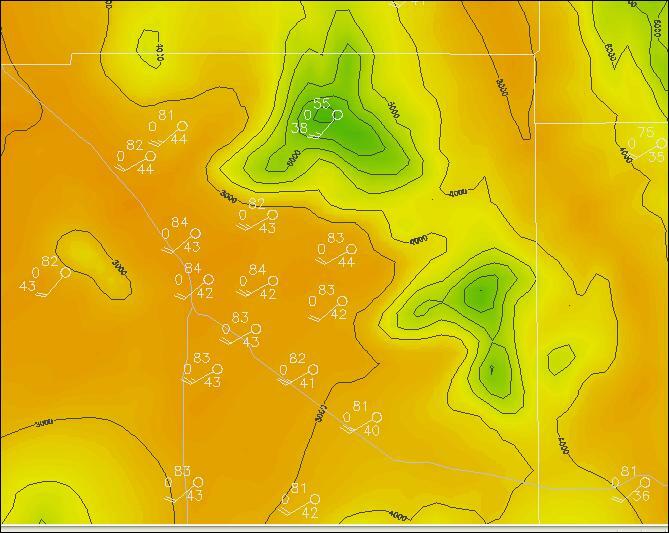 Tucson's afternoon high hit 101F today - see surface observations above. This is the second earliest date on record for a high temperature of 100F or more at Tucson. Another diurnal swing of 50F here at the house. Another issue - note the strange visibilities that are popping into the observations once in awhile. Three very low visibilities are reported above, with the 2 pm visibility reported as less than a quarter of a mile in haze. This has been happening during the afternoon on a number of days during the past week week or so. Either the ASOS system is out-of-whack, or construction or something similar is generating clouds of dust once in awhile that are blowing across the ASOS sensors. 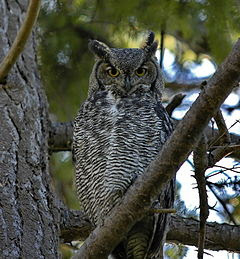 While walking this morning, I was lucky to observe both a great horned owl and a Cooper's hawk. 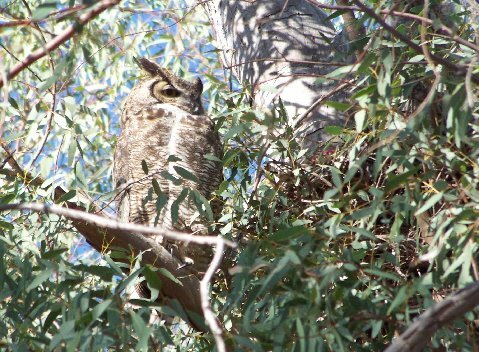 Cooper's hawks are fairly common here in Tucson, however, I have seen great horned owls only a few times over the years. Actually, I did not initially spot the owl, which was perched high up in a red gum tree, but came upon another hiker trying to get photos of the bird as the sun came up. Added note - I wish that I had taken these, but I'm an amateur with a cheap digital camera. These are non-credited, non-copyrighted photo grabs from the internet. I should have included this note on the original post - photos used in case readers don't know what I'm running on about. I also learned that a pair is nesting down there and some with binoculars can see several heads poking up out of the nest. So, I may take camera over there to see if I can get anything decent. 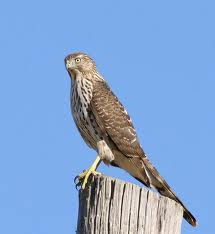 The night hawks have returned this week and the geckos have been hunting bugs on the kitchen window screen for a week or so. The timing is quite similar to last year. The Tucson high was 99F yesterday and morning low at house was 48F. Phoenix had a high of 103F. Perhaps a 100 or more in Tucson today - low this morning was only 51F.. [Corrected!] Sunday, April 22nd, is Earth Day. Designating a day focused on environmental concerns and causes, such as clean air, was proposed by Senator Gaylord Nelson of Wisconsin. His idea took hold and continues to this day. 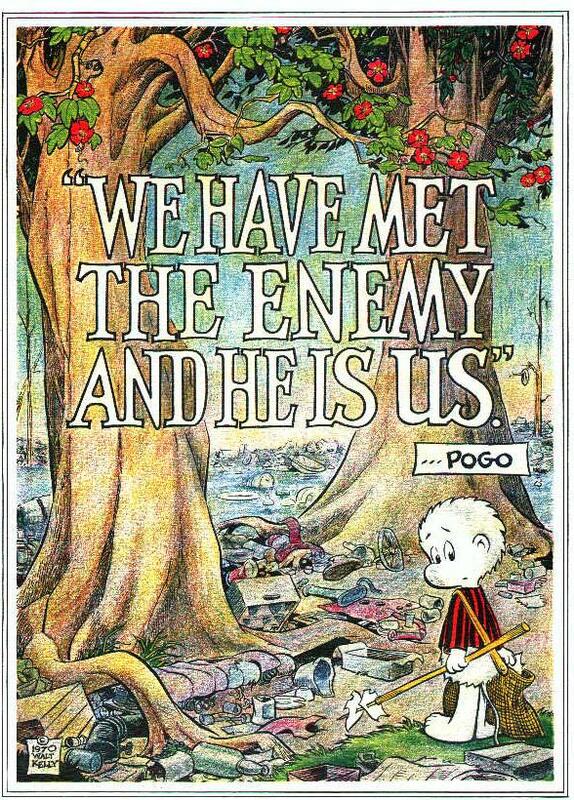 Cartoonist Walt Kelly designed his famous poster (above) for the first Earth Day. If Kelly were still around, he wouldn't have to make many changes to update his poster for 2012. Both the GFS and the ECMWF forecast models have a strong 500 mb ridge over the western U.S. over the weekend and into next week. Above is the ECMWF 500 mb forecast valid at 5 pm MST next Monday afternoon. The ridge is forecast to extend from northern Mexico, across the Four Corners region and on into Canada. Most interesting is the concurrent forecast of temperatures at 850 mb (below). The +20C isotherm (in red) extends northward across the border into Canada, A large area with 850 mb temperatures of +26C and higher is forecast from northern Mexico into Utah. It won't surprise me to see some 100+ highs in the Southwest before the ridge shifts eastward. Both global models now forecast the shortwave along the west coast to be more progressive, and no longer have this feature cutting off from the westerlies. Finally, while the West heats up, the ECMWF forecasts what could be Spring snow for the Northeast. David Cristiani sent the two photos (above and below) of dust storm in El Paso last Saturday (April 14th). Photos appear to have been taken on the UTEP Campus (although UTEP may be called something else these days). Dust was being picked up by winds ahead of, and with, last weekend's strong front. 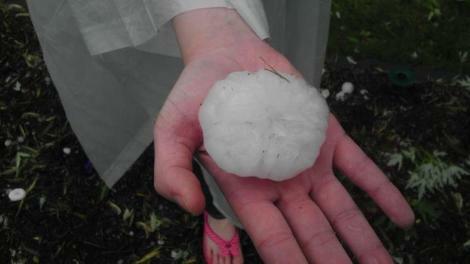 David reported: This is what I saw Saturday afternoon. 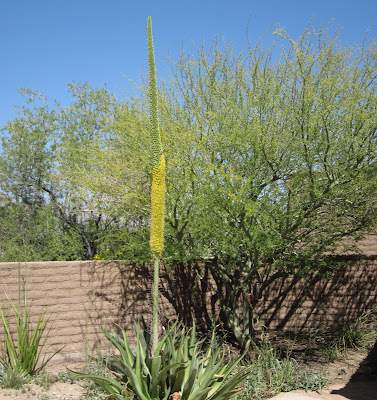 Things blowing about, a few ocotillos and trees uprooted, etc. Started as warm blowing dust shortly after noon or 1 pm, but it was in the low 50's by sundown. After dark, it magically stopped, and the sky was black, full of stars! Like nothing happened. Not one drop of rain in El Paso or Abq. 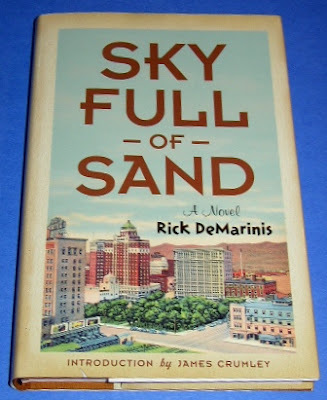 Writer Rick DeMarinis spent a year or so at UTEP and wrote a mystery (see below) appropriately titled "Sky Full of Sand." That's downtown El Paso on the "dust" jacket. Summer definitely seems to be coming fast. Yesterday the high at TUS was 90F, while low here at gouse was 40F - so another day with a 50F diurnal swing. As I walked along the Rillito this morning I was impressed by bright displays of yellow blooms - trees down in the cold wash seem further along than those here at the house. 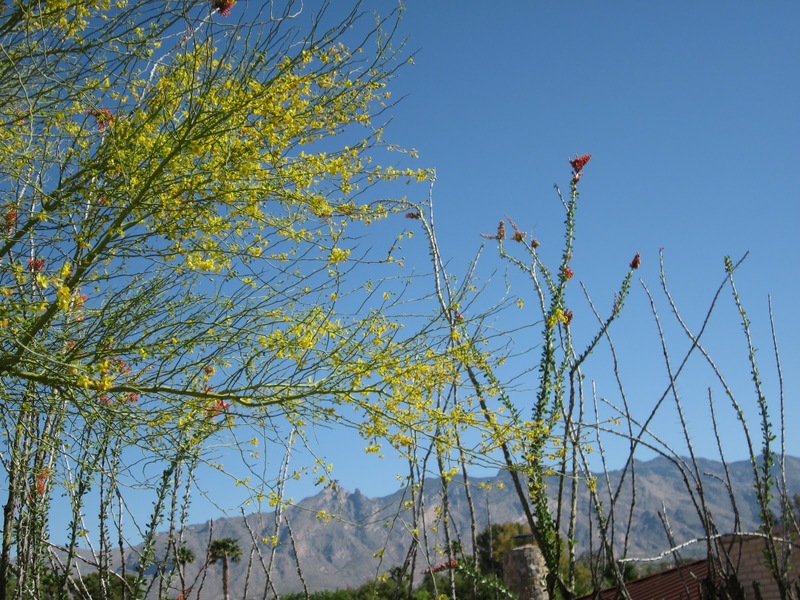 Above is shot of a native palo verde tree in the backyard with its yellow blooms mixed with a bit of red that's atop the ocotilla. Below shows another view of same tree, this time contrasted with the bright, waxy green of a tree whose name I don't know. It is native to Mongolia and is extremely drought and heat resistant - also has very wicked thorns, but does produce a small, apple-like fruit. 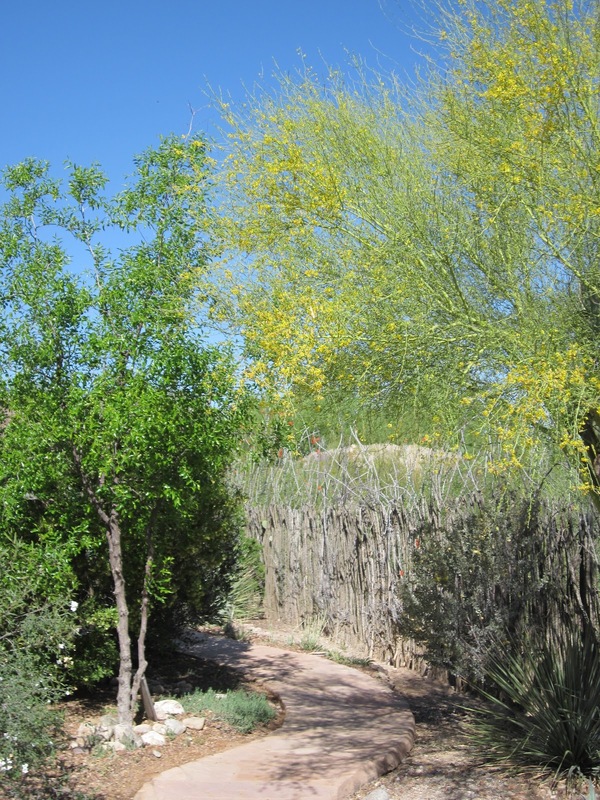 Native mesquite trees also bloom yellow and are in color along the wash, but not yet here on our street. Final photo above is of a palo brea tree in the courtyard that is just starting to bloom. In foreground is an octopus agave that has shot up its amazing spike, which is now blooming yellow from bottom to eventually the top. 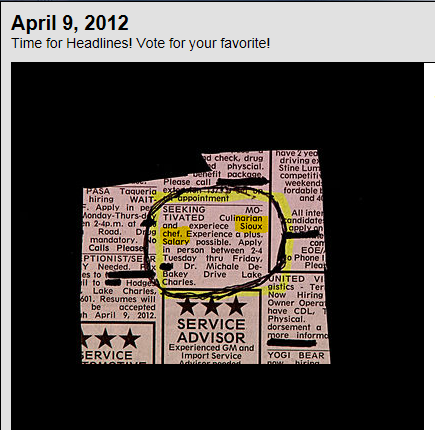 Katie forwarded the above advertisement from Lake Charles, Louisiana. Note that they are looking for a Sioux chef, with salary possible. My son Jason is currently a Sous chef up in Colorado, and is lucky enough to also get paid. But more interesting is that one of his friends is a full-blooded Comanche and also a chef. So who knows exactly what the restaurant in Louisiana is looking for! Have been looking at the long-range forecasts from the global forecast models this morning. Above 500 mb forecast is from last evening's ECMWF (144-hour forecast valid at 00 UTC 22 April). During the 5 to 7 day period the model forecasts a strong omega block over the west-central US and Canada. Then, during days 8 to 10 the ECMWF 500 mb forecast shifts the pattern toward a Rex block off the west coast of North America and amplifies the strong ridge over the north Atlantic (forecast below is 240-hours valid at 00 UTC 26 April). If the ECMWF forecasts verify, there's little to get excited about here in southeastern Arizona - except perhaps an early break of the high temperatures into the 100s. The important weather news this morning relates to yet another deadly tornado outbreak, mostly in Kansas and northwest Oklahoma. However, while I was examining soundings this morning, I went back to check on the Atmo WRF-GFS forecast from midnight Thursday night. 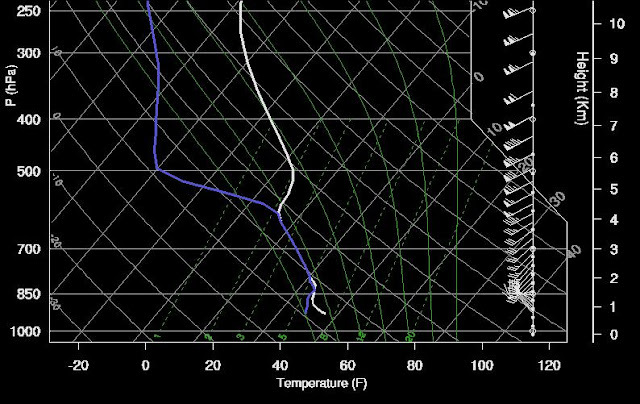 The forecast sounding for TUS is shown above (note that this is a 36-hour forecast). 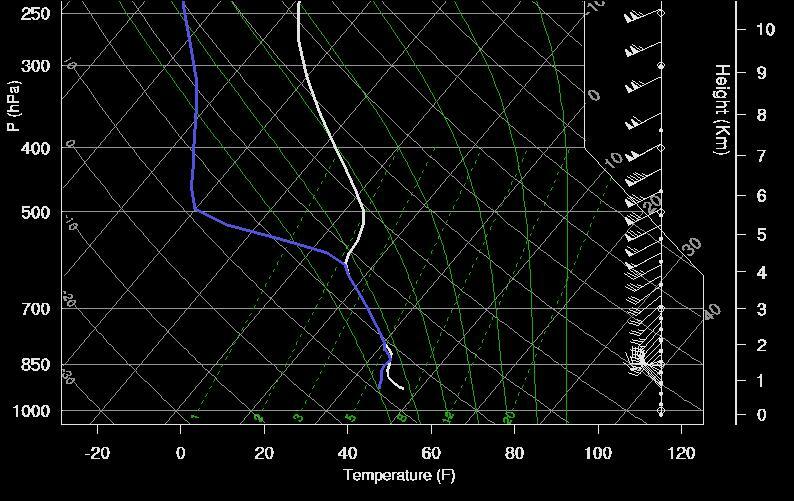 The verifying Tucson sounding is shown below. The forecast was very accurate, particularly wrt the depth of the layer that would support precipitation growth. The observed sounding was released around 4 am Saturday morning, before the front passed through the metro area. Thus, the forecast sounding (which had the front just through the metro area) was off a bit near the surface. But clearly another very useful forecast by the WRF-GFS. Thanks to Mike Leuthold for all his efforts in refining this local version of the WRF! The WRF-GFS forecast discussed on Thursday morning was, yet again, quite accurate. 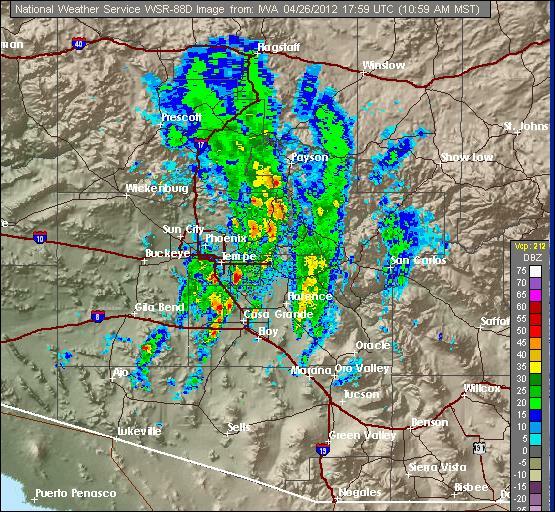 The front passed through the metro area of Tucson a bit before 6 am this morning (Saturday, April 14th). Showers began here at the house right around 6 am and have amounted to about 0.15". 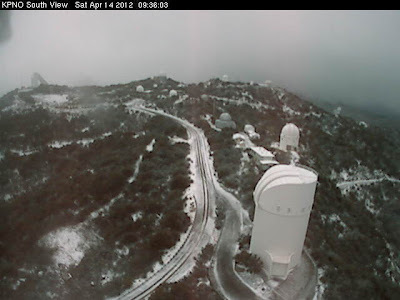 As the webcams on Kitt Peak and Mt. Lemmon (above and below) show, there was a light accumulation of snow on both mountains. 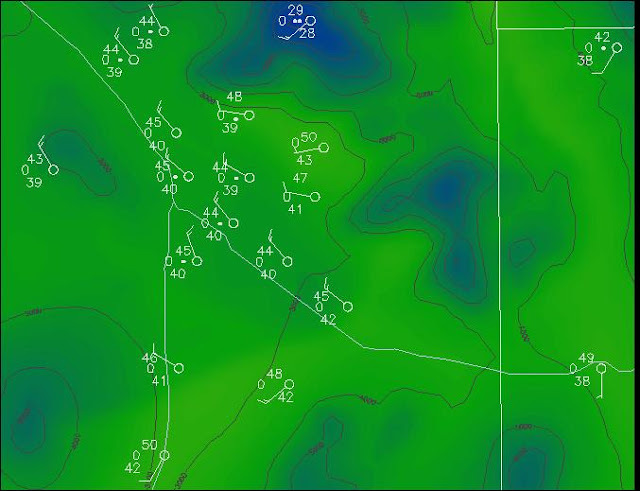 At 5:30 am only 20 of 93 sites in the Pima County ALERT network had measured rainfall - number with snow fall unknown. By 9:30 am only 3 sites in the far south part of network had not had precipitation. Amounts were generally around 1 to 2 tenths of an inch in the lower elevation metro areas. 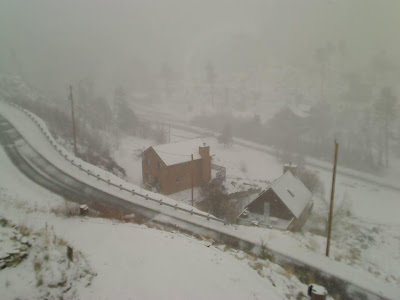 Higher amounts were measured both on Redington Pass and along the northwestern foothills of the Catalinas - 9 sites had over half an inch with maximum amount being 0.91". There are still showers around, so final amounts could increase a bit. Another mid-month, fast-hitting weather event - will this be April's only event? Long range forecasts show little promise at this time, but there's still more than 2 weeks left in the month. This morning's WRF-GFS early run remains similar to yesterday's, although precipitation amounts are down some. This morning's NWS NAM forecasts an even lighter event. The table above is the WRF-GFS forecast numbers for today and tomorrow. Widespread, but light precipitation, and some very chilly low temperatures at sunrise on Sunday. There is a fairly large area of PW amounts from 25 to 30 mm heading toward the Southwest - see blended PW product for 1300 UTC this morning (above). The WRF-GFS forecast soundings (below is for 5 am MST tomorrow morning) indicate that precipitation growth will occur below 600 mb, with dry air aloft at higher levels. Perhaps this is the reason for the lighter amounts in the early run today. Now mostly a matter of watching the event unfold. The early run of Atmo's WRF-GFS model today has pushed the precipitation for southeastern Arizona a bit back in time, but the model forecasts a widespread weather event. 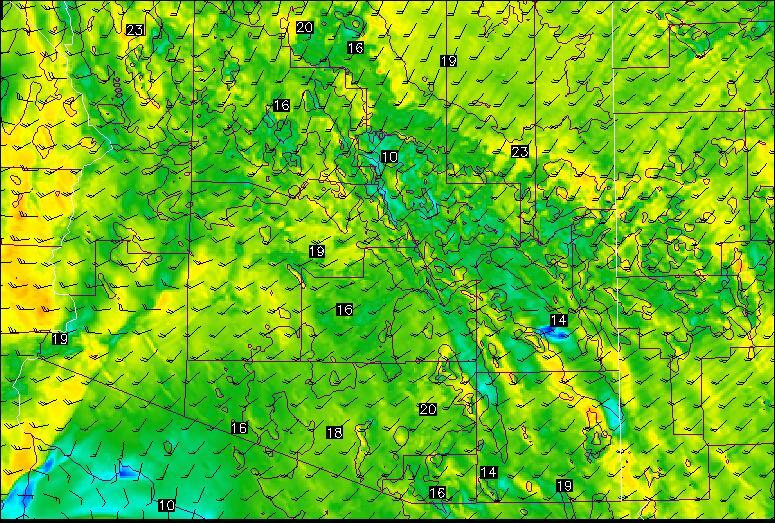 First gusty winds, and then a Pacific frontal passage around sunrise on Saturday morning (above is forecast surface plot for Tucson area valid at 6 am MST on Saturday morning, April 14th). The greatest amounts of precipitation remain at higher elevations, but model still predicts a couple of 1/10s for the low elevation, metro area (below is total forecast precipitation through 11 pm Saturday night). There are nice color bar legends with these products, but I can't easily grab both the graphic and color bar with a screen snip. The view north from Kitt Peak this morning at a bit before 8 am MST shows the hazy boundary layer that has persisted much of the week. 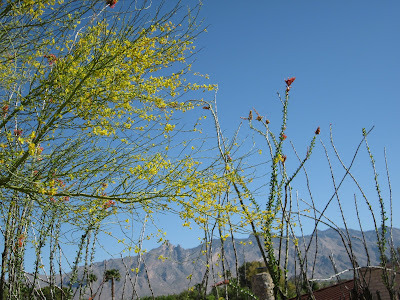 This morning was, in fact, the cleanest that air here in Tucson has appeared for several days. However, the boundary layer continues to hold suspended dust and tons of pollen - pollen counts are maxed out for some species, and those with allergies are suffering. What's in store the next few days? The 500 mb short wave that's coming ashore in California today will stay north, brushing by southeastern Arizona, with winds kicking up and probably an upturn in dust. The early WRF-GFS forecast run at Atmo indicates southwesterly winds with speeds of 15 mph or so this afternoon. These winds are at 10-m agl and surface conditions will probably be gusty. Then as the next system moves in rapidly, and further south, the GFS forecast of 10-m winds for 4 pm MST on Friday the 13th (above) indicates widespread strong winds across the state. So no relief in sight for those whose eyes and noses are watering and running. 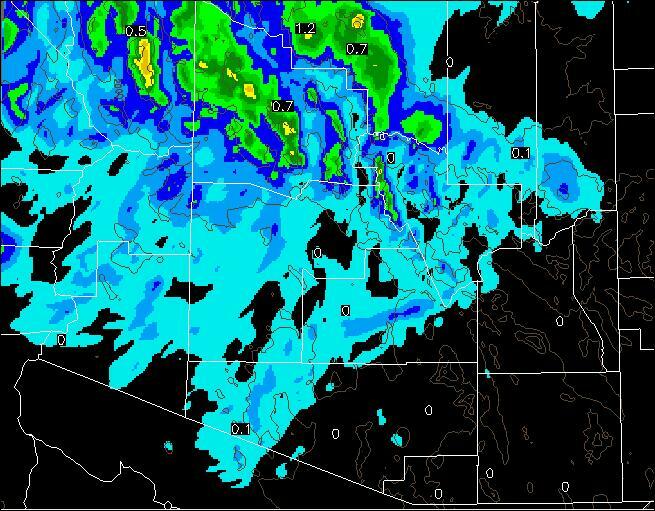 The GFS forecast of total precipitation through 11 pm on Friday (below) does indicate light showers across western Pima County by then. We can hope that there'll be enough precipitation to clean up the air some. It also appears that high temperatures this coming weekend will be on the order of 30F cooler than they were over Easter weekend. So, another mid-month weather event for southeastern Arizona. 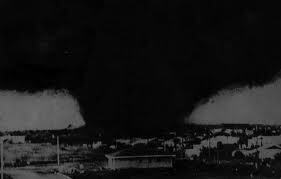 On Tuesday, April 10th, 1979 (33 years ago today), a large, F-4, tornado struck the city of Wichita Falls, Texas. The tornado devastated a large part of the city and resulted in 42 deaths. There was a severe storms field program underway (AVE-SESAME), and special upper-air data were being taken across a large portion of the south-central U.S. This research data base led to the April 10th tornado outbreak being one that was studied extensively, especially from a numerical prediction perspective.